When rolling defense dice against a normal attack from an adjacent figure, all excess shields count as unblockable hits on the attacking figure. When counting spaces for Charos's movement, ignore elevation. Charos may fly over water without stopping. Charos may pass over figures without becoming engaged. Charos may fly over obstacles such as ruins. When Charos starts to fly, if he is engaged he will take any leaving engagement attacks. Does Charos' Counterstrike work against Samurai? As a unit that follows Ullar, Charos may benefit from Acolarh's ULLAR'S AMULET movement bonus. As a Unique Huge Dragon Hero, Charos may benefit from the Greenscale Warrior's LIZARD KING BONDING activiation bonus. As a Dragon, Charos provides the Nhah Scirh Cultists one additional attack die when it is targeted. Who else could I draft with Charos? Who does Charos work well against? 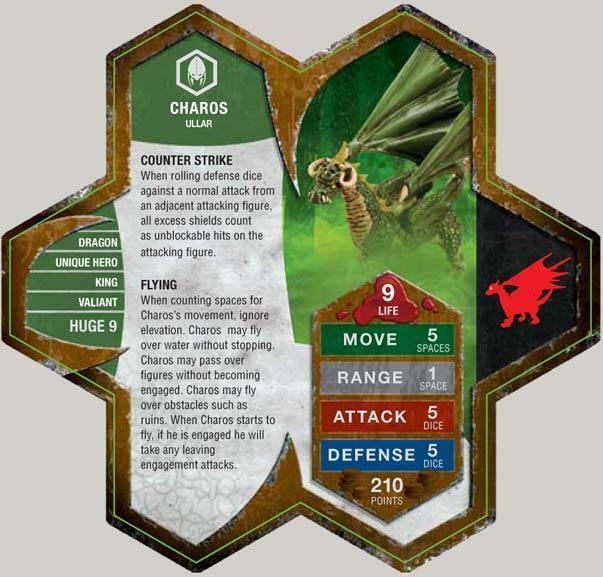 Charos is sturdy and mobile, and a great answer to that timeless question, “what do I do about Q9?” Take maximum advantage of Counterstrike by engaging quickly, bludgeoning your opponent’s heavy hitters with 210 pts of wings and teeth. Supported with Raelin, Charos rolls SEVEN dice for Counterstrike. That’s right. Seven. While your opponent deals with having this terror in his midst, you bring up your ranged support. Counterstrike means Charos doesn't need order markers on him to earn his keep, but help him out by focusing your fire on any opposing ranged troops. Well...then again... Thinking about it, this guy can pretty much run over anything you throw at him. I think the only people who CAN beat him are range fighters, but, really, the only range fighter that MIGHT be able to hurt him is Q9...And Q9 has a nasty little habit of not being very mobile, while Charos is quite the opposite. Even if you were to drop the Deathwalker 7000's 20 roll, you wouldn't kill this guy. Those points, though...I dunno, I'd prefer the samurai if you were getting Charos for his counterstrike ability. It sure is alot for a counterstriking flier, and in most armies, he doesn't leave alot of room for anything else. I was originally going to say that the answer to him was Su-Bak-Na, but, I really began to realize that, even if you're swinging that much damage, you're not going to get to him most of the time. He's a tough beat, ol' Charos. The times that I have played against Charos, I have faired very well. I have used my legionaiers and Marcus to surround him then brought up the Roman archers to volley against him. Raelin was mine (and usually is) so he had no back up. 6 dice versus 5 is pretty good odds you'll hit, then I was getting swings in with Marcus and the legionaires. I think that in a turn and a hlaf I had him beat down. When I have used him, he served his purpose, before I acquired Jotun, he was my Deathwalker slayer. In one game though, he was brought down sooner than I would have liked by Utgar's minions who were on a little higher ground. He is worth the points if you're lucky and know how to get hiim in there to wreak havoc. One of my favorite aspects of Charos is that his high life allows you to leave an engagement while shrugging off the free strikes. This plus his flight makes him ideal for hunting down the heart of the enemy. If my opponent has Raelin I go eat her first then whoever is close by. Partnered with Kelda you can do the disengage romp all over the map then fly her in when he is low to pump him back up to full. He is one of the few figures that can stand there taking it a couple turns while you are able to move Kelda into place to be of use. Which is why the Knights of Weston are an ideal means to hold Charos in place. While 1 undefended attack die is easy to ignore, it's not so easy to flee from a possible 8 undefended skulls. Charos is also a good figure for kids (7-11). It's always easier for them to play a big and robust dragon then many figures with plenty of special abilities to remember. The KoW are a good counter but not quite as capable as you might suspect. In the last Dallas Tournament my son played Charos and mercilessly ate two squads of knights although they did hold him down long enough for reenforcements to appear. Unfortunately, Kelda wasn't in play or Charos could have continued his meal with the Sentinels and 4th Mass who finally took him down. It takes a minimum of 8 turns for Charos to go through 2 squads of Knights . What in the world was your sons opponent trying to take him down with that couldn't inflict enough wounds in 8 turns to take him out? Eight turns...Does that include Counterstrike? Nothing like being able to attack during your turn and deal damage on your opponent's turn too. TECHNICALLY, it could take only ONE turn after Charos becomes engaged to eat a squad of knights. Self-induced illiteracy should be a crime!! !